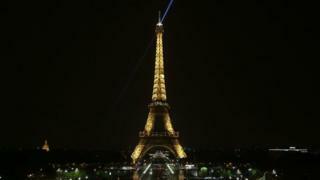 Paris has won a battle to host the European Banking Authority (EBA), which will relocate from London after the UK leaves the European Union. The French capital's victory follows a win earlier for Amsterdam, which will host the London-based European Medicines Agency (EMA). Paris was picked after lots were drawn when three rounds of voting failed to produce a winner. The EMA and the EBA currently employ about 1,000 people in London. French President Emmanuel Macron tweeted that the win for Paris was "a recognition of France's attractiveness and European commitment". Ministers from the 27 EU countries remaining in the bloc after the UK departs in 2019 took part in a secret ballot to pick the victors. Some 16 cities bid for the EMA, while eight wanted to host the EBA - Brussels, Dublin, Frankfurt, Paris, Prague, Luxembourg City, Vienna and Warsaw. The final vote pitched Paris against Dublin. Frankfurt, which is home to the European Central Bank, lost out early in the voting. The EMA is the more alluring of the two bodies, as it promises to make its new host into a hub for Europe's medical industry. Commenting on the decision to award the EMA to Amsterdam, Italy's Europe Minister Sandro Gozi said: "It's like losing a final on penalties." Steve Bates, chief executive of the UK's BioIndustry Association, said: "Businesses now need certainty. The best way to do this is by an early agreement to a transition timeframe and continued close regulatory cooperation. "We must now ensure Brexit does not disrupt the safe supply of vital medicines to tens of millions of families in the EU 27 and the UK." Slovakia had been campaigning hard to make the case for relocating the EMA to Bratislava. Following its failure to win, diplomats say Slovakia may seek to cushion the blow by seeking support for its finance minister becoming chair of the Eurogroup, which runs policy for the eurozone.